Reduced from $199 to $149 for a limited time only! Alyson Steel is one of the most successful Voice Over performers working today. 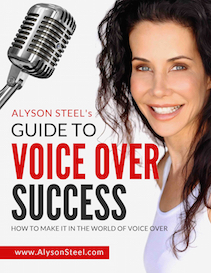 In her new eBook, an audio program- Alyson Steel's Guide to Voice Over Success, she walks the aspiring performer step by step through how you can put your Voice Over career on the fast track.